The Asia-Pacific, the most dynamic region in the world in terms of economic development, is heavily and increasingly dependent on its ocean spaces both in terms of providing critically important routes for international trade but also the valuable marine activities and resources that they offer. Asia-Pacific seas are subject not only to increasing variety and intensity of uses and exploitation but also to enhanced threats, for instance in terms of marine pollution, conflicting activities and the over-exploitation or destruction of vulnerable marine resources and environments. The maritime Asia-Pacific is, moreover, rife with significant maritime issues and disputes which demand attention. These issues and challenges feature complex geographical, environmental, historical, geo-political, socio-economic and legal dimensions thanks to the diversity as well as strategic importance of the area. These facets arguably make ocean law and policy challenges in this area especially difficult to resolve in comparison with those of other regions in the world. An Asia-Pacific region in turmoil, with conflicts potentially triggered by oceans-related disputes, would have catastrophic implications globally. With escalating ocean governance challenges coupled with mounting tensions in the region, maritime studies focusing on this area has become an especially pertinent topic for scholarly exploration and research. 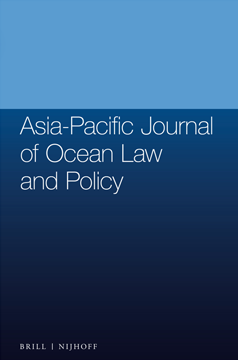 The Journal serves as a platform to promote interdisciplinary maritime studies with a special reference to the Asia-Pacific region. Consequently, diverse contributions relating to the governance of the Asia-Pacific oceans are welcomed. Moreover, the Journal particularly welcomes manuscripts that take an interdisciplinary approach.